I caught a tow on this truck a couple of times. Good boys. This was on the road from Mexico City to Puebla. My mindless reverie was broken by the sound of a truck downshifting on the curve below me. It had been a long steady climb up to the border of Nicaragua and we’d been working on it for it hours. The road rose gently ahead of us though and we could keep up this pace all day if we had to. The truck behind us downshifted yet again, and my ear, exquisitely trained from riding over 10,000 km without a mirror, instantly registered the low grumbling and converted it into useful information: truck type, distance, speed, and time until passing. A little alarm bell went off inside my head, bringing my full attention back to the road around me. It was an alarm that I hadn’t heard in a very long time, not since Chiapas, Mexico: There was a wave coming. I glanced back over my should and saw that my suspicions were confirmed. The truck slowly coming up the hill behind me was an old one, with sides formed from brightly painted wooden slats. It was probably transporting a heavy load of sand or gravel because it was struggling to keep speed going up the hill. True, it was gaining on me, but not by much. It was perfect for surfing. “Truck surfing” is a sport I first got into in the Mexican state of Nayarit. It quite simply consists of grabbing onto the back end of a passing truck and letting it tow you and your bicycle up a hill. I call it truck surfing because I find the technique of catching a truck very similar to catching a wave. You need to wait for the right one, it needs to be going the right speed, and as it comes up behind you, you need to suddenly put on some speed at just the right instantly such that you are able to grab a hold of part of the tail end and enjoy the ride. How long you can ride out the wave depends mostly on how good your grip is, and how long before your hand gets tired of dragging you and the heavily loaded bicycle. The drivers in this part of the world absolutely love it, and at one point in Mexico I could have sworn that drivers were deliberately slowing down for me – probably having talked on the radio with the last truck I had grabbed on to. Besides being great fun, truck surfing can save you a tremendous amount of time and effort. A ten minute surf not only saves you from 30 or 40 minutes of hard climbing, but it also lets your legs rest for those 10 minutes. Unfortunately, opportunities to truck surf are few and far between. You need to have the perfect conditions: a very heavily loaded and slow truck, a very long steady hill, a half decent shoulder, and something on the truck to grab on to. 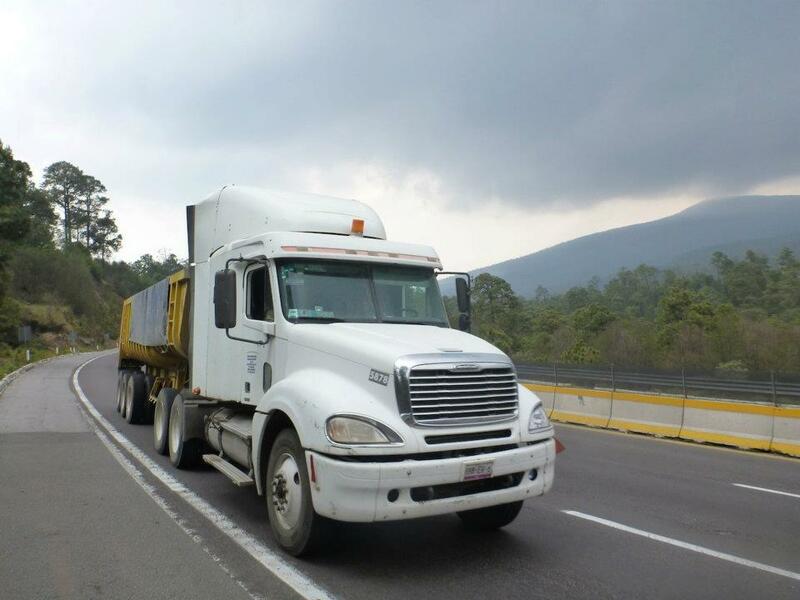 In Guatemala, the roads are so steep and tough that every truck in the country has an incredibly powerful engine, meaning that they would pass by me far to quickly. In Belize, there were no hills. In Chiapas, there usually wasn’t a shoulder to ride on. I had gone over four months without a single opportunity, but today we finally had a wave to catch. The truck was now almost upon me. I glanced back again and could see now the wooden slat running along the length of the truck that would make for an excellent handle. I shifted up a couple of gears, and as soon as the truck was about 5 m behind me I stood up and started pumping the more powerful gears. Tony lurched forward as the truck began to pass us and in another couple of seconds we were matching its speed. We were now about halfway along the length of the truck, but I couldn’t maintain this speed uphill for very long, so it was now our never. I eased back just a tad on the pedaling, and let the truck pass me the rest of the way before once again equalizing our speed. Now I was in the perfect position to grab on and so I eased Tony closer to the truck – ignoring the large whirling truck tires at my feet – and reached out a hand and grabbed on to the wooden slat. Perfect. I let my hand take my weight as I eased off the pedaling and soon I was enjoying the effortless ride to the top of the hill. It’s not quite effortless though. Not only is it a strain on your left hand, but you also have to steer your heavily loaded front wheel with just your right hand, much harder to do than it sounds because the eccentric force of the tow means a constant effort needs to be made to keep the bike running straight. It’s even harder when you have a rough shoulder to ride on. If you can hang on for ten minutes, you caught yourself a pretty good wave. Can’t wait for the next wave.